"The Devil is at the origin of the first misfortune of mankind. He is the secret enemy that sows errors and misfortunes in human history." Once the devil put poor Linda Blair in his sights in 1974, kids and young adults in horror movies everywhere began to fall under his gaze. Indeed, The Exorcist opened the door for Satan and his minions to corrupt youth and innocence at every turn. The Italians especially went Beyond the Door in an attempt to Shock viewers with a variety of Eerie Midnight Horror Shows. Just when you thought it was safe to take your kid to creepy Italian villas, Code Red has unearthed yet another Italian knock-off called The Night Child. Apparently one dance with the devil wasn’t enough for Beyond the Door star Richard Johnson, who once again must battle the forces of evil when they begin to torment his on-screen daughter. Johnson is Michael Williams, a documentary producer whose newest film is about depictions of devils and demons in artwork. A curious art slide turns up with no form of identification accompanying it; Williams chases the trail, which leads him to Italy, where a local countess (who doubles as a psychic) warns him about pursuing the truth behind the painting. Of course, he doesn’t heed the warnings, which leads to a series of bizarre events surrounding his daughter. Already tormented by the violent death of her mother, young Emily soon becomes even more disturbed and violent as she falls under the spell of an age-old curse that’s linked to her mother’s medallion and the decrepit old mansion that houses the painting. If you go into The Night Child expecting a Eurotrash take on the insanity offered by The Exorcist, you’ll likely be disappointed. Indeed, this one is a bit of a plodding, meandering effort that’s often dry as a graveyard bone. To have so much going on plot-wise, very little actually ends up happening for much of the running time. You’ve got Johnson juggling multiple duties: unraveling the mystery surrounding his daughter, producing his film, and even trying to seduce Joanna Cassidy. Little Emily spends much of the film either screaming or just looking creepy while being possessed by the demon that haunts her. It all barely comes together, but it’s all cohesive and coherent enough--it’s just not very exciting. In fact, half of the film’s run time elapses before the spookiness begins to set in. That wouldn’t be a bad thing if the film took advantage of its creepy premise and setting, but it doesn’t. This is a shame because when you’re dealing with the devil, all bets really should be off. Instead, all of the supernatural events basically add up to a few bumps in the night and an uneventful murder scene. The highlight of Emily’s disturbing, demonic behavior involves her smoking and not much else. Sure, actress Nicoletta Elmi looks appropriately wide-eyed and disturbed most of the time, but you’d think the trio of writers could have come up with something a bit better than that. Dallamano does what he can to spice things up visually--he throws in some requisite eerie touches, such as a mysterious blind man, a three-legged dog, and an abundance of old, decrepit settings that are full of cobwebs and long corridors. If anything, the film looks the part, and one wishes the story had the same life and spark as the visuals. The rest of Dallamano’s effort is thoroughly Italian: expect lots of zooms, awkward dubbing, and a score that’s composed of a half dozen variations of the same droning tune. The cast is full of familiar faces that have shown up in plenty of horror productions. Despite all the assembly of talent and experience, no one seems compelled to give a great performance--only solid ones that get the job done. Elmi is noticeable for having shown up in a multitude of Italian horrors under the direction of the likes of Bava and Argento; as the titular character here, you just end up wishing she had more to do. Instead, the whole film just ends up being a disjointed experience that feels like so much filler sandwiched in between a couple of interesting bits. The film’s ultimate reveal shows hints of a well thought-out concept, and it all culminates in an unexpected and even bewildering ending. It’s not enough to rescue the film from being possessed by the devil of mediocrity, however. 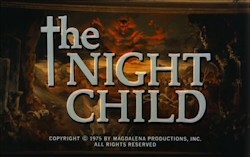 If you’ve exhausted its other, more famous brethren, The Night Child will be a mundane, disappointing experience. Also, it can at least claim to be a watchable film that features Joanna Cassidy battling the devil and his minions; the same can’t be said about her return bout that came about a decade later under the direciton of Wes Craven. True to form, Code Red is responsible for scraping the bottom of the barrel to find this one. The newly restored elements have this one looking as good as it ever will; it’s still full of scratches and some faded colors, but it’s otherwise fine. The audio similarly isn’t without its fair share of hiss or pops, but you’ll hear everything just fine. 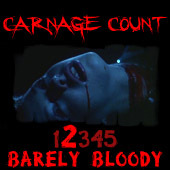 Extras include an interview with Richard Johnson, an original theatrical trailer, and trailers for other Code Red releases. It’s a decent release for a film that otherwise would have languished in obscurity anyway, and any fans should probably just be happy to see it arrive on DVD. Rent it!